Chances are, no matter where you live, you’ve enjoyed a bowl of rice. Known the world over in a multitude of varieties and forms, rice is undeniably one of, if not the most important staple grain on the planet. According to the Food and Agriculture Organization of the United Nations, rice was the primary food of over half the population in 2004 and was cultivated in 113 countries—it’s found on every continent except Antarctica. For what is, simply put, an edible grass seed—that’s pretty incredible. We’re spotlighting rice in all its variety and sharing our tips and recipes to help you move confidently in the direction of a perfect pot, any day of the week. In the past, it wasn’t atypical to see just one, two, maybe even three—if you were lucky—varieties of rice on supermarket shelves. Now, depending on where you shop, it’s likely that there are at least five different boxes and bags to choose from, harboring varieties that vary widely when it comes to color, taste, texture, and best uses. Struggle to make sense of the shelves no longer—here’s what you need to know about the ten most common rice varieties on the market. Brown rice: Brown rice is light brown in color because it has not been milled and still has its bran layer intact. The only part that has been removed is the inedible outer hull, making brown rice a nutritious whole grain. It requires both more water and more time to cook than white rice but offers a nuttier taste and chewier texture. Brown rice is almost always of a long- or medium-grain variety, meaning it’s usually between three to five times longer than it is wide. Because the bran is intact, brown rice can spoil in storage and usually has a shelf life of about 6 months—although you can find brown rice that’s been heat treated to prevent spoilage. Brown rice that has been properly refrigerated or frozen can last for up to 5 years. White rice: When brown rice is milled and polished, it becomes semi-translucent white rice with a bright, shiny appearance and much longer shelf life—when stored properly, it’s indefinite! Any white rice below is the same in this regard, so, as a rule of thumb, always keep your rice in an airtight container or sealed bag that ensures no contaminants get in and you’ll never have to worry about it spoiling. Basmati rice: An aromatic long-grain rice, basmati rice is a somewhat dry, fluffy rice often used in Indian, Nepalese, Pakistani, and Indonesian cuisines. Almost 70% of the world’s basmati rice is grown in India—specifically in the north of India, at the foothills of the Himalayas. Grains of basmati rice tend to stay completely separate even after cooking and the rice itself has a mild, buttery flavor on its own. You can also find brown, or unmilled, basmati rice. Jasmine rice: Another aromatic long-grain rice, jasmine rice is grown throughout Thailand, Cambodia, Laos, and Vietnam. Named after the jasmine flower native to Southeast Asia, this rice does have a slightly floral aroma and subtly sweet, buttery flavor. The grains are moist, soft, and a bit sticky—often clinging to each other when cooked. You can also find brown, or unmilled, jasmine rice. Sushi rice: Sometimes known simply as Japanese rice, sushi rice is a sticky short-grain rice with a soft, tender texture and pearl-like shape. A specific cultivar of “Japonica rice,” sushi rice is the staple grain in Japan and, although sometimes sold unmilled, or brown, it is most often eaten white. This is the variety used to make sake, rice-based beers, and Japanese rice vinegar. It can be distinguished from Japanese sticky rice (also called glutinous or sweet rice—more on this later) by its softer texture, more translucent color, and slightly less round shape. Risotto rice: Risotto rices are plump short-grain and typically Italian rices with lots of starch. Specific types include Arborio, Carnaroli, Vialone Nano, and Maratelli. Each have slightly different characteristics, but all are generally more expensive than other rice varieties due to their comparatively small-scale production processes. Rice is truly what makes risotto risotto, as these varieties are naturally armed with enough starch to create a creamy, glossy dish but are large and full enough to keep a somewhat firm, toothsome bite and avoid turning into mush—because nobody wants mushy risotto. Paella rice: Similar in look to Italian risotto rices, paella rices are short-grained Spanish rices that can absorb a lot of liquid. Bomba and Valencia are the most popular for their tender, moist, and sticky but-not-too-sticky texture. These also tend to be on the more expensive side, and if you can’t find a paella rice, you can swap in a risotto rice. Sticky rice: Also known as glutinous (an unfortunate misnomer, as it contains no gluten whatsoever) or sweet rice, sticky rice is made up of almost completely opaque grains that are especially sticky (how convenient!) when cooked. Although particularly common in Laos—both production- and consumption-wise—sticky rice is found in both sweet and savory dishes throughout Southeast and East Asia. From Chinese lo mai gai (steamed lotus-leaf wraps with glutinous rice and chicken) to Japanese mochi (sweet rice cakes), sticky rice, while not as common as other varieties of rice, is an essential component of many traditional dishes. 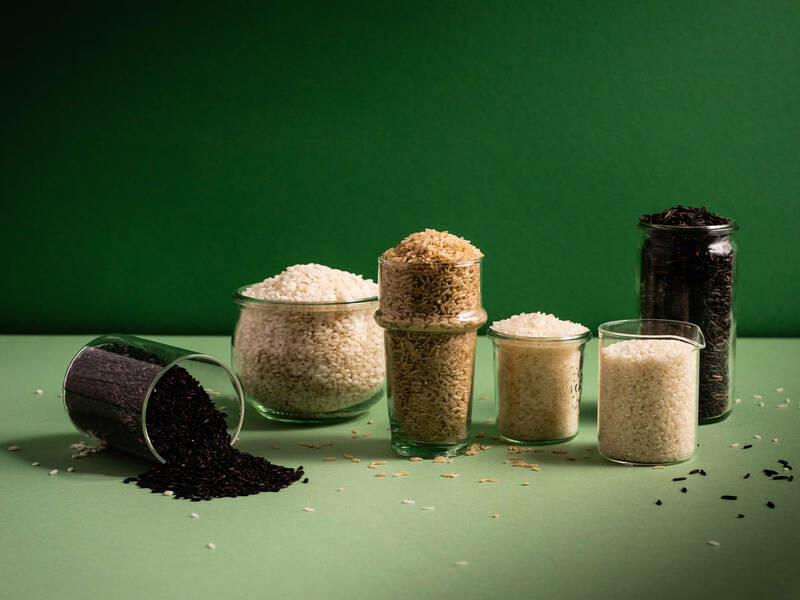 Black rice: Sometimes also referred to as “forbidden” rice, black rice is often touted as a health or even a superfood and said to be much healthier than other rices—which is, of course, yet to be solidly proven. There are different types of black rice, the most common being Indonesian or Thai in origin. The rice looks black when raw but turns a sort of dark purplish color when cooked and takes on a nutty taste similar to that of brown rice. Wild rice: With earthy, vegetal taste and chewy texture, wild rice is of the family Zizania aquatica or Zizania palustris, not Oryza sativa or Oryza glaberrima, like the other rice varieties in this guide. Native to North America, India, and China, wild rice is most popular in North America and has been eaten by the native people groups (the most well-known of which are the Ojibway) in the Great Lakes region for, according to some sources, over one thousand years. In some places, wild rice might be difficult to get, as it’s not widely cultivated. Enriched or fortified rice: Enriched or fortified rice is processed in a way that tries to add back some of the nutrients lost during the milling and polishing of the grains. Thiamin, iron, and niacin are the main vitamins and proteins added in, but don’t be fooled—enriched white rice is still not as “healthy” as brown rice. Parboiled rice: The main advantages to parboiled rice, usually only found in medium- or long-grain varieties, are twofold: first, the typical parboiling process (although it varies) boils the rice while it’s in its inedible husk, forcing some of the nutrients that would be lost during the milling process deeper inside the grain. Secondly, the rice becomes more brittle, making the milling process easier and ensuring less broken pieces—though, fun fact, these fractured pieces in turn form the basis of a popular Vietnamese dish known as com tam or, literally, broken rice. Parboiled rice maintains its shape when cooked and is similar to basmati in that it lacks a sticky texture, however, it doesn’t absorb liquid as much or as easily as rice that has not been parboiled—making it ill-suited to dishes like risotto or paella. This type of rice is also more expensive, takes longer to cook than plain white rice, and, according to many—myself included—is less flavorful than other varieties of rice. Boil-in-bag rice: Boil-in-bag rice is usually a variation on parboiled that claims to make clean up quicker and easier, but for the higher price you pay for the individual, packaged portions and compromises you have to make in terms of flavor, I think the cons here outweigh the pros. Precooked or instant rice: For those who want the convenience of a quicker cooking rice and are willing to shell out a bit more money for it, precooked or instant rice is the best option. It’s rice that’s been cooked and then dehydrated, so it really only needs to be soaked in hot water for a short time before it’s ready to eat. It won’t provide the best textured or flavored rice, but it will save you time in a pinch. It’s sometimes the simplest things to cook that make people the most nervous and uncertain—and rice is definitely in that category! But whether you’ve never cooked rice before or you’re a rice cooking novice, once you familiarize yourself with the four main methods of rice cookery, you’ll see there’s nothing to be scared of. The absorption method: The classic way of cooking rice, the absorption method combines a measured amount of rice with a measured amount of water in a pot or saucepan. The rice is then boiled, covered, and simmered until all the water is absorbed into the rice. This is not only the most straightforward way to cook rice, but also the most nutritious. The only thing to take note of here is that different types of rice need different amounts of water and time to cook. Follow our how-tos for step by step instructions on cooking basmati and sticky rice with the absorption method. The steaming method: Typically reserved for sticky (glutinous) rice, this method involves spreading the rice grains out into a metal basket, woven or bamboo steamer which is then set over a pot, wok, or special hourglass-shaped vessel of boiling water. The rice is cooked by the steam and is never submerged in or let to touch the water directly. The pasta method: If measuring isn’t your thing, but pasta most definitely is, this might be the right rice cooking method for you. Sprinkle the rice into a large pot of boiling water and stir every so often as you would pasta. Test it along the way and once it’s done to your liking drain well in a fine sieve. We find this method to be the best for wild rice, but you can also use it for parboiled, brown, Arborio, and even jasmine rice—just be careful of over cooking the rice; test it often for doneness and drain it earlier than you think, as it will continue to cook from the residual heat even after its been drained. The rice cooker method: Cooking rice in an electric rice cooker is arguably the easiest method of all, but it requires the purchase of a machine that, if left unused, has the potential to end up in the dusty pile of forgotten kitchen electronics. A measured amount of rice and water go into the cooker—just like the absorption method, which the electric rice cooker actually uses as well—the power switch is activated, and the cooker will switch off automatically once the rice is done. It will also keep the rice nice and warm by switching on over timed intervals, a helpful feature if you’re not planning to eat the rice right away. If you’re cooking a lot of rice and have space in your kitchen, a rice cooker is a nice option, but it’s by no means necessary to make an amazing batch of perfectly cooked rice. Depending on the preference of who taught you to cook rice, you may or may not rinse your rice before cooking it. Many countries in Asia prefer to wash their rice at least once or twice, until the water used to rinse the rice is clear. Along with the rinse, you can also soak rice anywhere between 30 minutes and overnight in order to make the grains themselves less brittle and raise the moisture content—allowing the cooking water to penetrate the grain more easily. Neither rinsing not soaking are truly necessary, they are simply personal preferences and rituals of habit, but many claim that rinsing rice can make-it or break-it. Rinsing off the excess starch from the rice grains can indeed make the batch less likely to clump or become mushy, so do a trial run for yourself and let us know in the comments if you’re team pro-rinse, or no-rinse. Bad rice, or what went wrong? If you can pinpoint the reason behind a bad batch of rice, it will make it that much easier to get to the perfect pot, so here are a few tips and tricks for the main issues you might come across when cooking rice at home. My rice is too mushy and/or wet: Super sticky, clumpy, mushy, or wet rice could mean that you used too much or even too little water for the particular amount of grains—so double check your ratios. It can also mean that you might prefer rinsed rice (see our notes on that above) or that you forgot to let it rest after it finished cooking. Like I said before, rinsing your rice is not necessary, but letting your rice rest is. After the starches in the grains reach the high temperatures in the pot, they need time to cool down and set back up to create the desired rice texture. If you stir or try to fluff too soon, you’ll disrupt this process and could create a clumpy, mushy mass (not applicable to wild rice). My rice is scorched and/or really stuck to the pan: There are three reasons that could be the cause of scorched or stuck grains. One is that you simply have the heat too high; once the water is boiling, you should cover the pot and turn the heat down to low. If this doesn’t solve the problem, you might need to try cooking the rice in a pot with a heavier bottom, or on a burner that can go lower than the burner you had been using when the rice burned. The last reason for rice stick-age could be that you simply forgot to stir the rice before covering it and letting it do its thing. Giving it a nice stir once it’s up to a boil and before you cover it should alleviate much of the sticking, but of course lots of rice is by nature quite sticky. If you’re having trouble during cleanup, simply let the stuck-on bits soak in hot water and scrub them off gently. There are so many great uses for leftover rice. I would even argue it’s not at all a bad habit to get into cooking double the amount of rice you actually need for any given dish in order to reserve half of it to use for these leftover rice recipes. Fried rice: For those of you who don’t already know, fried rice actually tastes best with leftover rice. Paired with a fridge-clearing combination of vegetables, maybe a bit of bacon or an egg, and a light drizzle of soy sauce, dinner is sorted. Rice porridge or soup: Another easy and stick-to-your-bones satisfying way to use up leftover rice is to swirl it into soup or make a rice porridge. To make a simple rice porridge (also known as congee or juk), simply add stock and the leftover rice in a 4:1 stock to rice ratio and simmer until the rice grains fall apart. Season to taste with soy sauce and serve with sliced scallions and sesame oil. You can also add grains of leftover rice to finished soups before serving to add some heft and texture; try it in a classic chicken noodle soup in lieu of noodles. Arancini: Leftover risotto? Make arancini. Born in Sicily, arancini are savory, fried balls of risotto that may or may not contain caverns of mozzarella, béchamel, or even meaty ragù within their crisp, lightly breaded walls. You can use any kind of leftover risotto to make them, just make sure to really roll and press them tightly together before breading—this will help them stay together when frying. Whether you enjoy a bed of pure white rice as an unadulterated base for a flavorful main, or you prefer your rice as a central component to a dish, we’ve got a recipe that will work for you. Sweet and a savory, we hope you find inspiration that fits all your rice cooking wishes!